I'm really, really hoping that the boom in independent markets is not a fad. I love them for so many reasons. I love talking to the sellers (often the makers) about what foods would go well with the cheese I just tasted or different ways to prepare the 2lb sweet onion I just bought. I love running into my next door neighbor while checking out the apples and then going to have a cup of hot cider with them. 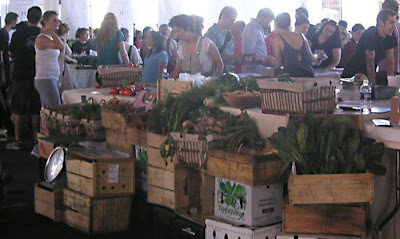 And I truly believe that everything tastes better when it's freshly picked or prepared! As a wonderful celebration of New York's local food suppliers, the New Amsterdam Market couldn't be a better example of what I'm talking about. Set under the highway just one block north of the South Street Seaport and right in front of the former Fulton Fish Market, it was a glorious conglomeration of fresh and prepared foods, none of which had travelled more than 2-3 hours to get there. Their list of vendors is very impressive. I wish I could convey taste over the internet (don't try licking your computer screens! ), but almost everyone had samples out and, if it was in arm's reach, I tried it! The Orignal Cider from Bellwether Hard Cider was one of the best, light ciders I've ever had. While they aren't in NYC yet, I don't think it'll be long before they are! 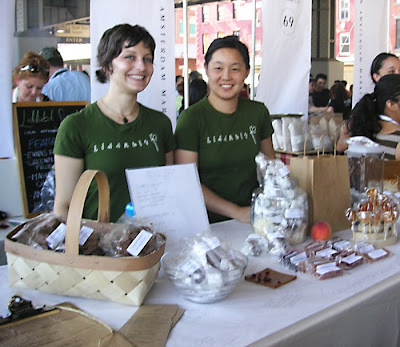 The ladies at Liddabit were offering very tasty candies made all the way in... yes... Williamsburg! They had some of the best jellies (think Gummy Bears made with real fruit) I've ever had. 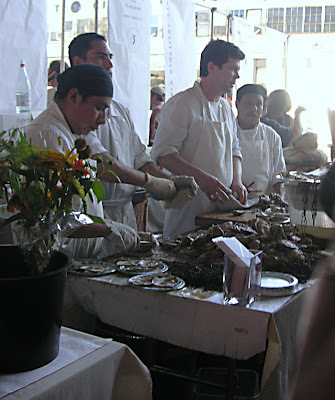 The boys from Stella were busy shucking oysters. They'd lost track of how many they'd done. 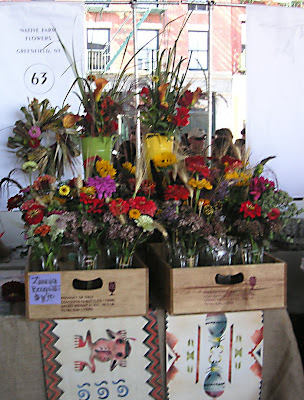 The flowers from Native Farm Flowers were absolutely stunning. I think their chaotic bounty of colors felt so anti-Martha, that I wanted to cheer. 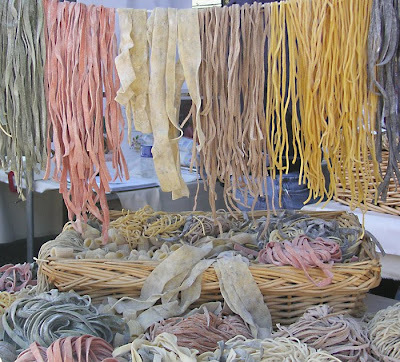 One of my favorite displays had to be this colorful string of pasta from The Ravioli Store. Gourmet pasta made in Long Island City! 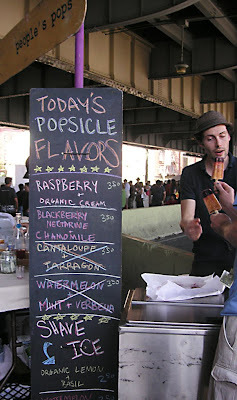 And not to be missed - The People's Popsicles! The colors of their ice cream are as glorious as their flavor combinations. There's nothing tentative about Cantaloupe & Tarragon! There were so many other things I tried: cheeses and breads, wines and yogurts, pickles and Maple Bacon Brittle... It was a smorgesboard. If you go, don't think this will fill you up (it is all small bites), but do go with some cash in your wallet because you will find something you want to take home. 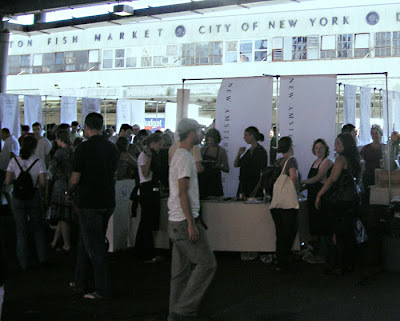 While, sadly, the New Amsterdam Market isn't open every weekend, it is now a monthly event. Which is a huge improvement from only once a year. They will be setting up again on October 25th, November 22nd, and December 20th. As it is all outdoors, they will be shutting down over the winter months, but based on the huge turnout I saw last weekend, they will definitely be back in the spring!